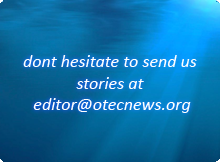 Looking at the latest developments in the OTEC world, much has been going on with regard to research and testing, but also policy developments in Europe and Northern America. Yet with the latest announcement of Lockheed Martin and Reignwood Group to install a 10 MW power plant in China, more and more attention is payed to South East Asia with a great potential for OTEC. OTEC will also be addressed at the upcoming Offshore Renewable Energy Conference (OREC2013), a major conference which is held held in Singapore from 29th to 31st October 2013. Within the domain of Offshore Renewable Energy it will bring together different stakeholders ranging from academics, researchers, engineers, business professionals but also government policy makers. In combination with the Singapore International Energy Week (SIEW) with a total of 10,000 research, business and policy leaders it aims on sharing the latest developments in policy, fundamental research, readily-commercialized technologies within the offshore energy sector. SEAcORE is planning to have a Focus Group Discussion (by invitation) on the role of the Government in increasing the uptake of ocean renewable energy in South East Asia. There are also be technical sessions and Round Table Discussion under OREC 2013 that focus mainly on Ocean Renewable Energy. Mary Ann Joy Robles Quirapas, Project Officer – Wind and Marine Renewables at SEAcORE mentioned explicitly that “OTEC will be one of the key technologies discussed during the SEAcORE events, due to its promising character for South East Asia”. She also invites OTEC stakeholders to become active in the SEAcORE activities upcoming October and to submit abstracts to the OREC2013.